In 1984, political cartoonist Mike Peters wanted to branch out and begin his own daily comedy strip. He always imagined it based on a dog that acted like a real dog, unlike the anthropomorphic Snoopy over in Peanuts, because he found he could relate to a dog. Mother Goose and Grimm was centered on Mother Goose who lived in a shoe (combining the fairytale Mother Goose with The Old Woman Who Lived in a Shoe) with her dog, hyperactive yellow Bull Terrier Grimm (named after the Brothers Grimm), dimwitted Boston Terrier Ralph, and belligerent purple cat Attila (named after Attila the Hun). They lived in a world populated by a mix of fairy tale creatures and normal humans. The strip is steeped in pop culture, often spoofing or referencing things that are big at the time and notable fictional characters. When the muse descends, the strip could abandon its core cast and continuing story in favor of stand-alone one-panel gags. The strip debuted on October 1st and is distributed by King Features Syndicate to over 800 newspapers. The first Mother Goose & Grimm strip. At the height of the strip’s popularity, Tribune Media decided the time was right to try and duplicate the success fellow comic strip Garfield found in being translated to animation. 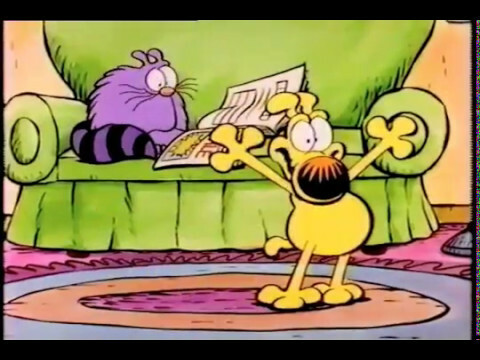 To hedge their bets, they contracted Garfield and Friends’ production companies, Film Roman and Lee Mendelson Productions, to produce the series, and the show’s story editor, voice director and primary writer, Mark Evanier, to perform the same duties (which also meant hiring a number of the same staff). Hell, they even found a home for it on the same network, CBS, and had commercials with Garfield (Lorenzo Music) promoting the show. Mother Goose and Grimm debuted on CBS on September 14, 1991. It starred real-life husband and wife Charlie Brill and Mitzi McCall as Grimmy and Mother Goose, respectively, with veteran voice actor Greg Burson as Attila. Wang Film Production Company and Cuckoo’s Nest Studios handled the animation and duplicated Peters’ style perfectly; making it seem like the show jumped right off of the newspaper page. Peters himself designed the series’ opening of Grimmy trying to elude overzealous dogcatcher, Sven Rottweiler (Hal Rayle, impersonating Arnold Schwarzenegger), which was directed by producer Phil Roman. Ron Grant composed the series’ music. Each episode was broken up into two segments with Evanier writing most of them. Gordon Kent and Earl Kress penned the remaining ones. 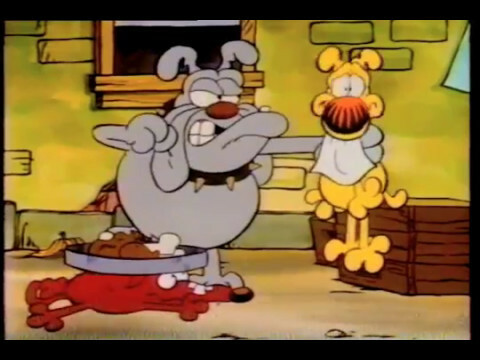 The strip’s sarcasm was toned down in favor of more traditional cartoon slapstick, particularly centered around Grimmy’s fascination with household appliances (a trait shared by his creator) and his love of fire hydrants and garbage, as well as 4th wall-breaking humor reminiscent of Garfield. A recurring gag in the end credits featured Peters’ wife Marian performing a variety of imaginary functions on the show (like choreographer) with a corresponding nickname (like “Flash Dance”). Grimmy at the mercy of neighborhood bullies. Along with the normal (exaggerated) ordeals of a dog’s life, Grimmy sometimes had to deal with a gang of neighborhood bully dogs on top of the dogcatcher. 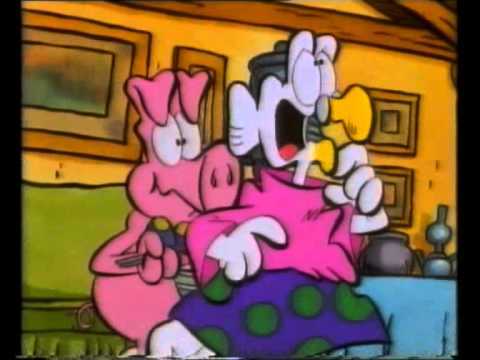 A major recurring character on the show was Mother Goose’s neighbor Ham (Eddie Deezen), one of the Three Little Pigs (actually numbered four including a sister, all voiced by Deezen) that was constantly afraid of the Big Bad Wolf (Gregg Berger) coming for them. A silent fish named Lassie (named after the dog) was Mother Goose’s other pet. Unfortunately, despite duplicating nearly all the components of Garfield and Friends, the actual success of the series was not as easily duplicated. The show struggled through its 13-episode run, although it did bring in respectable enough ratings to be brought back for a second season of reruns. CBS conducted research on its failings and determined that kids were put off by the title, believing it to be just “nursery rhyme” stuff. They changed the name to simply Grimmy for the second season complete with a new opening. The name change did the series no favors and it was permanently cancelled by March of 1993. “Puppy Love Story / Brotherhood of Ham” (9/14/91) – Grimmy falls for a dog he met in the park that ends up being a cat. / Ham alerts his brothers to a wolf sighting in town, however it turns out he’s given up pig eating for real estate development. “Expensive Taste / Lassie Swim Home” (9/21/91) – Mother Goose wins the lottery but Grimmy ends up eating the ticket. / Grimmy takes Lassie for a walk and ends up losing him while trying to prevent some cats from eating him. “Funny Business / The Boogie Man” (9/28/91) – Needing to pay for destroying Mother Goose’s garden, Grimmy gets a job as a court jester’s assistant. / NO SYNOPSIS AVAILABLE. “Grimm Encounter / The Grocery Grabber” (10/5/91) – While camping, Grimmy encounters alien dogs. / NO SYNOPSIS AVAILABLE. “Ham Alone / Sheep Thrills” (10/12/91) – Ham is worried that the wolf is after him and holes himself up in Mother Goose’s house. / Mother Goose writes an updated version of Little Bo Peep starring Grimmy. “Hero Worship / Search for Soap” (10/19/91) – Grimmy tries desperately to meet his hero, Carl the Wonder Poodle, only to discover he is a she. / After Grimmy accidentally destroys the TV, Mother Goose stops at nothing to try and get to watch her favorite soap. “The Fur Flies / It’s a Flea Country” (10/26/91) – Getting a chance to enter Attila in a cat show, Mother Goose tries to ensure Grimmy doesn’t scare the fur off him. / While Mother Goose tries to teach Grimmy a trick to beat Jack Sprat’s dog, his fleas drive him nuts as they go camping. “Bone of Contention / The Sweeper Creeper” (11/2/91) – When two bully dogs steal Grimmy’s food, he ends up in a museum trying to feast on a dinosaur bone. / Grimmy and Attila find themselves at the mercy of Mother Goose’s vacuum cleaner. “Pussycat Pooch / Open All Night” (11/16/91) – NO SYNOPSIS AVAILABLE. “Getaway Grimmy / Tail of a Puppet” (11/23/91) – Overhearing a phone call, Grimmy and Attila believe Mother Goose wants to get rid of them. / Being pursued by the dogcatcher for not having a leash, Grimmy uses a puppet with a leash on his tail to fool him. “The Egg and Us / Hyde and Go Seek” (11/30/91) – When Humpty Dumpty falls off a wall, Grimmy, Attila and Ham have to find a Dr. Gleep to fix him up. / Grimmy accidentally drinks some of the formula Dr. Jekyll left behind on his last visit. “Trash Night Trouble / Mirror Monster” (12/7/91) – NO SYNOPSIS AVAILABLE.